Madge has decided to resign to make a point with Paul. 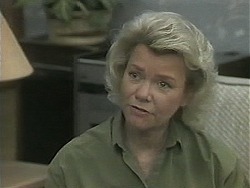 The new Assistant Manager of Lassiters in the girl from No.24 - Paul introduces her as "Linda Giles". "Linda" and Melanie recognise each other. Melanie warns her to watch out for Hilary - she's nosing at the house. Paul tells Melanie in the outer office that she's not to spread the gossip - they might be making a terrible mistake. He warns Melanie not to upset "Linda". Deborah has decided to give up Rhys for adoption after all. Jim tells Beverly not to panic - they've had Rhys for so long the authorities might decide it's better for him to stay with them. He's made an appointment to see their counsellor at 12am today. Beverly tells Jim bitterly that if he hadn't dragged the police into it, they wouldn't be in this mess now. 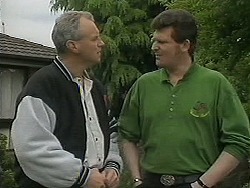 Jim sees Des on the street - Des's boss has booked him in for a motivation course. Beverly is very pessimistic about keeping Rhys. Helen tells her off for continually blaming Jim - they'd have had no peace of mind for years if they'd kept paying the money. She's just making it harder on herself by fighting with Jim. Paul is off to a meeting with a client and suggests Caroline has a look around the complex while he's gone. Just then, Helen comes in and Paul introduces her to "Linda". Beverly is in a bit of a better mood this lunchtime much to Jim's surprise. Beverly tells him that she's spoken to the solicitor and he thinks they've got an excellent chance of keeping Rhys. They hug. Helen sees "Linda" picking up her mail and goes over to have a word with her. Linda is surprised that half the hotel staff live in Ramsay Street(!) Helen invites Linda over for dinner, but she puts her off saying she's busy this week. Melanie is eating her lunch when Des comes in. He's looking for Paul to have lunch. Melanie asks him about the course - she quite fancies doing it herself because she needs to stand up to Paul! 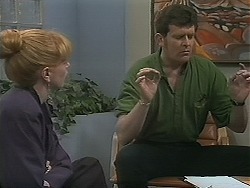 Des says that Melanie has to be assertive and starts telling her some of the contents of his course. Things like, "Think like a winner and you'll be a winner!" Melanie isn't convinced - Paul might fire her! Jim and Beverly are back from the session with the adoption counsellor - apparently he wasn't very optimistic. Their biggest problem is that Jim is too old to be put on the adoptive parents waiting list - apparently you have to be under 40. Beverly is very upset. Paul sees "Linda" outside the Waterhole and asks her what she thought of the hotel complex. She seems a bit confused and tells him that she liked it. She tells him that she thought the Waterhole was "beautiful" too. She hastily gets up, saying she'll see Paul back at the office later. Melanie noses into Paul's file on Linda Giles. Unfortunately, Paul comes back and catches her. Paul tells Melanie off for snooping - he's happy with Linda and that all she needs to know. But when Melanie has gone, he looks a bit perplexed. Helen is telling Jim about the new neighbour over coffee. Beverly tells Jim that she's thinking of going to visit Deborah herself and convince her to change her mind. She starts to cry and Jim comforts her. Melanie and Des are talking about the motivational course again. Des isn't really enjoying it but Paul tells him to stick with it - he knows people who've really benefited from the courses. Des decides to give it another shot. Melanie tells Paul that Linda isn't back yet. Melanie is suspicious and Paul agrees that she has been acting a little strangely. He hopes he hasn't hired the wrong person. "Linda" arrives home and it turns out that "Linda" is two people - twins, in fact! The twin Paul has hired tells her sister off for taking so long over lunch. They change clothes quickly and exchange notes about what she said to Paul. CAROLINE: If you've blown our cover...you know what will happen if anyone finds out there are two of us!